Christ Has Risen - He Has Risen Indeed! Franklin Federated Church is excited to welcome back the New England Ringers on Saturday, November 26. Come join us for a night of Christmas season tunes from this 15-member handbell chorus. The music selections this year include the familiar and beloved Dance of the Sugar Plum Fairy from Tchaikovsky’s The Nutcracker Suite, a rousing version of Handel’s Hallelujah Chorus, and a haunting rendition of God With Us for All Time, arranged by Betty Garee and featuring the gorgeous sound of our Cathedral Bells. These pieces and many more will delight and inspire concert-goers of all ages. Tickets are $15 and can be bought at the event or after any church service before the event. 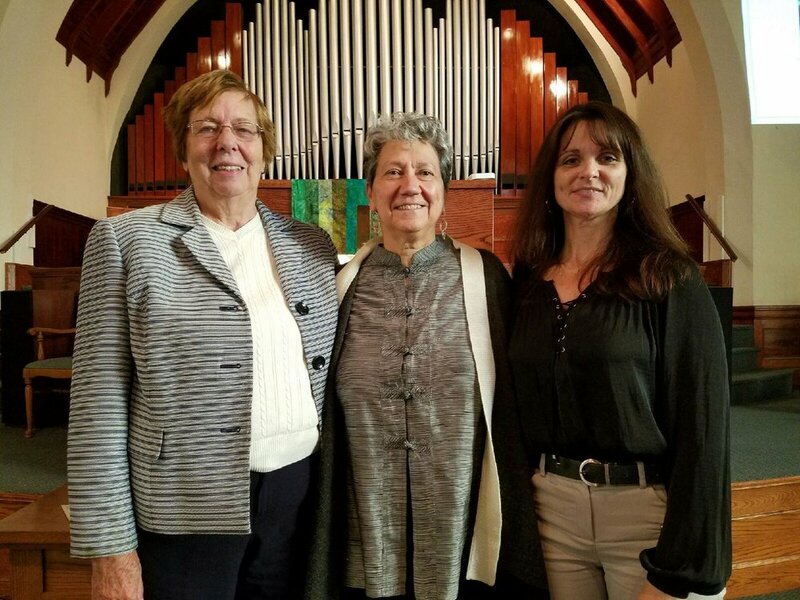 On October 16th, Franklin Federated Church was very pleased to present our first check to Marcia Szymanski, President of New Hope, for $10,000 from the church's Restoration Campaign which pledged 10% of the amount received for New Hope. New Hope is a non-profit organization serving domestic and sexual violence survivors. Missions has been supporting this organization for almost 20 years. The money is designated for the RESPECT program. This is a 40-week state-certified educational program for perpetrators of domestic violence. 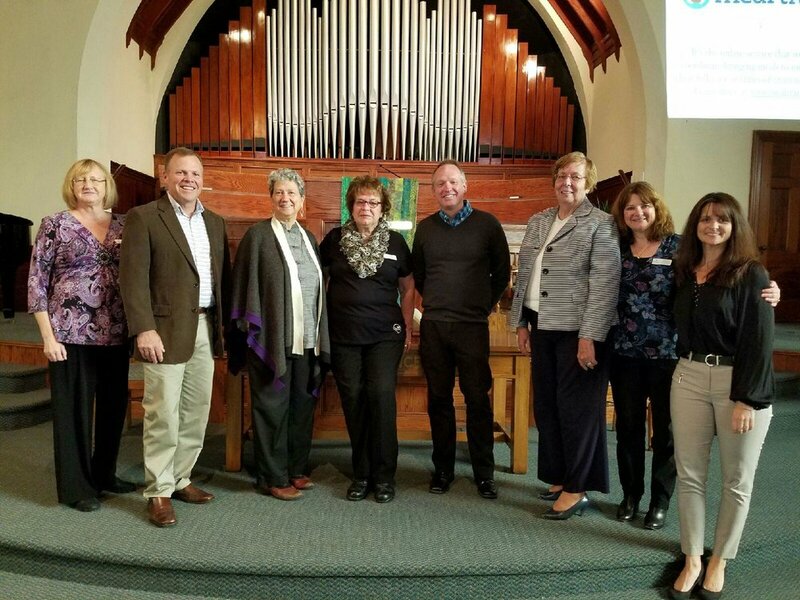 On October 16th, Missions Sunday, Franklin Federated Church was very pleased to welcome Jim Derrick, President of the S.A.F.E Coalition. He, along, with our pastor, Charley Eastman, gave a very informative overview about this organization. S.A.F.E. Coalition is a group of community partners coming together to provide support, education, and treatment options for those affected by substance abuse disorder. FFC will be partnering with this coalition in the near future. Franklin Federated Church held our annual rummage sale in October. The sale is widely anticipated by the community every year with strong attendance and provides a great boost to the church's fundraising efforts. The rummage sale helps to support the works of the church. We held a collection for toiletry items (soap, toothpaste, deodorant, shampoo) that were donated to the Franklin Food Pantry. Shoppers found great deals on books, toys, clothes (adult and children’s), household items, jewelry, electronics, sporting goods, antiques, small furniture items, and holiday décor. The items that weren’t sold were donated to charity. Hopefully we'll see you next year! Franklin Federated celebrated Rally Day to kick off the program year on September 11, 2016. The morning began with the children enrolling in Sunday School. During the service, Pastor Charley led the children in a "Blessing of the Backpacks." Following church was a potluck luncheon. The Franklin Federated Church hosted a PokéStop Meetup on Saturday which was covered by the Milford Daily News. Aspiring Pokémon masters were out in force in the town common Saturday afternoon. The Franklin Federated Church, which sits just opposite that grassy expanse, set up some amenities for Pokémon Go players on its front lawn. Volunteers underneath a small tent offered water, some frozen treats and a recharging station to the trainers. Tiffany Miller, a member of the church, said the idea to assist players came up in a meeting. "We just thought it would be fun to open up our lawn and invite people over," she said. "Everyone's trying to catch different Pokémon with their phone, and there are a number of PokéStops around here, like the church and the gazebo on the town common." Miller said she learned about the app a couple of weeks ago. "I have a 12-year-old son, and we've been exploring it together," she said. "We first read about it online." Join Franklin Federated Church on Saturday, July 23 from 1-4pm for a PokéStop Meetup. We'll have lures to attract rare Pokémon, phone charging stations, restrooms and refreshments. You can even compete at the gym across the street from our property! Come by FFC and see our Little Free Library open to the public. The Little Free Library program promotes literacy and public access to all types of written works. Borrow a book that's there or donate a book of your own to share with others. FFC joins a growing list of over 40,000 locations covering all 50 U.S. states and 70 countries. A Call to Prayer has been issued to American Baptists by the ABC National Executive Council, including: Susan Gillies, interim general secretary of American Baptist Churches USA, Jeffrey Haggray, executive director of American Baptist Home Mission Societies, Virginia Holmstrom, executive director of American Baptist Women’s Ministries, Reid Trulson, executive director of International Ministries, and Louis Barbarin, chief executive officer of MMBB Financial Services. In this painful summer, we call American Baptists to a season of prayer for those who have been affected by senseless acts of violence in cities here and across the world, as well as impacted by natural disasters. While we grieve the loss of life and livelihood for those directly affected, all brothers and sisters in Christ share the burden of helping, healing, and finding hope. We encourage American Baptists to set aside time to pray for God’s mercy to prevail and for each of us to have courage to respond as we are able. We asked our members to write down words that best represent the FFC community. Here's what we received. The welcome ministry is planning a family outing to the Pawtucket Red Sox to watch them play the Scranton/Wilkes-Barre Rail Riders. The cost is $13 per person and you can RSVP to Paulina Teng or the church office.